Sent in by becky who should have to buy and drink these on a daily basis (before paying for any other expenses she has) as punishment for ever thinking it would be a good idea to let me wife know about these. Please tell me it’s not disposable. Paris Hilton needs something to spend hr millions on. Nice but it better be Louis Royer XO or Lagavulin 16 yr single malt before I throw down $500 for the set. I think I am going to need a bottle of $100 water to revive me after reading that..
All five bottles doesn’t run you $600. It’s actually just under $700. You can put your name on the back for an additional 2,100 JPY ($24.50) per bottle. I cant find shipping outside Japan anywhere. Oh, for a second there I thought they would make pretty crystal decanters! hahaha HK is everywhere! 100 bucks for water? That water better be laced with LSD or some kind of wonder drug! 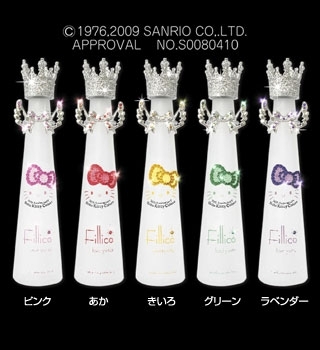 The bottles are nice, and elegant, however, 100 bucks really isn’t worth clued on rhinestones and plastic crystals. Hey does anybody know where i can buy/order the set?? This is insane! 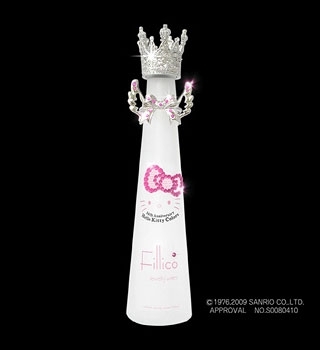 Hello Kitty has certainly taken the ridiculous idea of selling luxury water to new heights. It must take either a very rich fan or a crazy fan to want to buy that drink. Lol this post is absolutely hilarious! I might have to order some of this hello kitty water now. if it is hello kitty, it probably is luxury! Mmmm. I have their bags, merchandise, everything! I am a bit of a fanatic myself so i might have to get some, it has got me a bit excited. Where can i buy this water? I am gonna order some right now! I know the price is pretty steep but i think i might have to try it out. Which color do you recommend? Will they taste different to each other, or will they all taste the same.